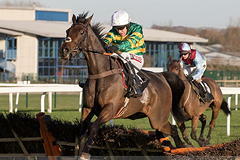 Harry Fry's Unowhatimeanharry completed a five-timer in the Albert Bartlett Novices' Hurdle at last season's Cheltenham Festival and appeared better than ever in Long Distance Hurdle at Newbury on his first start in the colours of JP McManus. Stepped back up to Grade One level, Unowhatimeanharry was the 6/5 favourite in the hands of Barry Geraghty, who was content to bide his time while Newbury runner-up Ballyoptic adopted more positive tactics in an attempt to reverse the form. Ballyoptic was pursued for much of the three-mile journey by Reve De Sivola, who won this prize three times in succession between 2012 and 2014, but the latter was back-pedalling before the home turn. West Approach, a half-brother to last year's Long Walk winner Thistlecrack, moved smoothly into contention, but all the while Unowhatimeanharry was making headway on the leaders. West Approach began to weaken in the straight and Unowhatimeanharry looked to be getting the better of Ballyoptic when that rival crashed out at the final flight. His exit gave the hot favourite breathing space and he kept up the gallop to score by four and a half lengths from Lil Rockerfeller, with Un Temps Pour Tout a distant third. Geraghty said: "He did it well. He had to work harder here than he did the last day. He had to work hard, so it was a good performance. "He's very good, but he only does as much as he has to. He probably has a little more class than he lets on." Fry said: "We're relying on the jockey's report (because of the fog), but Barry said it was a proper Grade One test and he's had to work hard. "We'll have a chat to Barry and the team and see where we go, but the races are sort of there - the Cleeve Hurdle (at Cheltenham) and hopefully the big day (World Hurdle) in March. "He's come through it and the dream goes on." Fry continued: "If he keeps doing that we'll be happy. We will let him come out of this, speak to the owner and the team and see what they want to do. "We will enjoy this first - it is a Grade One in its own right and a memorable day, for sure. "It means a lot. It is extraordinary. You could not ever hope for this or have predicted it, but that's what's brilliant about National Hunt racing. "Sometimes these horses come along and they just keep finding. He is progressing unbelievably and hopefully long may it continue." Trainer Neil King said of runner-up Lil Rockerfeller: "It was a career-best for the horse and he's run a fabulous race there. "We were just a little bit too far back and he was making his ground up to Mr McManus' horse all the way to the line. "I am very proud of him. Since his juvenile days we have said that three miles would be the making of him and it's rewarding. "He would have a serious chance in the World Hurdle. I really do think so. I really, really do." Sky Bet cut the winner to 3/1 from 4/1 for the World Hurdle at the Cheltenham Festival in March. Racing PR Manager Michael Shinners said: "Unowhatimeanharry is going from strength to strength and we still don't know when his improvement will level out. "There are a few cards to be shuffled in the stayers division ahead of March but Harry Fry's star will be heading to the World Hurdle and he's our 3/1 joint-favourite alongside reigning champion Thistlecrack, who will obviously be diverted elsewhere should his chasing career remain on an upward trajectory."